Ringdroid is now on GitHub! 2 December 2016: Ringdroid 2.7.4 contains a fix for an audio bug reported by users using 'Nougat' (Android 7.x). 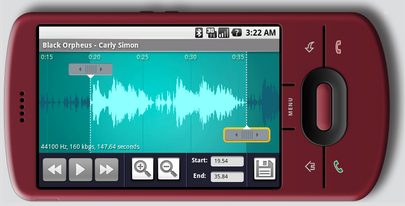 22 June 2015: Ringdroid 2.7.3 contains fixes for several bugs reported by users of Ringdroid 2.7.2, and it uses WAV as a fall-back audio format for saving ringtones in case the default AAC (.m4a) encoding fails. 11 May 2015: Ringdroid 2.7.2 does not require the full network communication permission anymore as the code in charge of gathering anonymous usage statistics has been removed. 29 April 2015: Ringdroid 2.7 now supports 'Lollipop' (Android 5.x)! This version requests the audio recording permission in order to use the device's microphone. It also includes the ability to read OGG Vorbis audio files, and it now saves ringtones in AAC (.m4a) format. This is the recommended version for Android system versions 4.1 ('Jelly Bean') and newer. 23 August 2012: Ringdroid 2.6 is the recommended version for Android system versions 3.0 ('Honeycomb') to 4.0.4 ('Ice Cream Sandwich'). This version of Ringdroid requests full network communication, but solely for the purpose of sending anonymous usage statistics as described in the app's 'Privacy' menu. 2 January 2011: Ringdroid 2.5 is the recommended version for Android system versions 1.6 ('Donut') to 2.3.7 ('Gingerbread'). New features include a drop-down menu in the select view to edit/delete/assign ringtones and notifications, flinging support to scroll the waveform, and MR475 AMR files support. This version of Ringdroid requests full network communication, but solely for the purpose of sending anonymous usage statistics as described in the app's 'Privacy' menu. 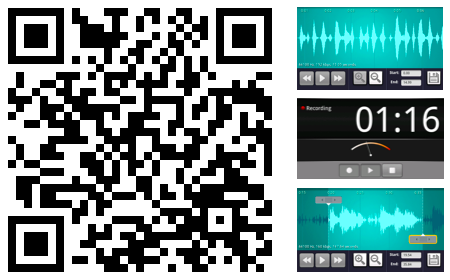 Ringdroid is an Android application for recording and editing sounds, and creating ringtones, directly on the handset. If you have an Android phone, just click on "Market" and search for "Ringdroid" to install it, or open the "Barcode Scanner" app and point to the QR code at the top of this page. Watch this video of Noah Kravitz of phonedog.com creating a ringtone using Ringdroid! Launches automatically in response to the GET_CONTENT intent with a mime type of audio/ if any other application wants to pick an audio file - for example the "Rings Extended" application. Assign a ringtone directly to a contact.